Having recently completed a Zoology BSc at Cardiff University, I came across the Sakaerat Naja Project looking for experience in the field with herpetofauna. The project was a fantastic opportunity to enhance my knowledge of herps and acquire further conservation skills. I enjoyed completing my dissertation on herpetofaunal spatial ecology in the Yucatan Peninsula of Mexico which had inspired me to find further field work, particularly focusing on snakes. Being keen on travelling to new places, Thailand appeared like a fascinating country to experience new cultures and discover a diverse range of herp species in situ. At my time here, I hope to learn and develop numerous skills which will be invaluable experience which I hope to use throughout my career working with animals in the field of conservation. Hailing from London in the UK, I’m a recent graduate, having received my BSc from the University of Southampton in June. During my time at university my abiding interest in Herpetofauna great and small only expanded, and this led me to the Sakaerat Najas Project where I can combine developing my field skills with spending time with extremely interesting animals. I have previously worked in projects relating to snakes in the UK and beyond, and joining a radio telemetry project seemed to be a natural next step in developing conservation skills I will be able to apply throughout my future career. There’s a lot to like about Thailand and a lot to learn, too. It seems that every day so far I’ve seen a new species, and there are plenty more critters hiding in the forest I’d love to get to see. But cobras are really something special- everything they do is very subtle (well, maybe apart from their threat displays!) and there’s very little research into their behaviour. Hopefully in my time here I’ll be doing my bit to help understand them a bit better and find out what they’re really up to out there. When I was a child, I was always fascinated by animals and the natural world. So much so, that my parents would always tell me “when you are older, you are going to be living in a forest, in a tree house with long hair and beard”. I’ve done the long hair phase, I can’t grow a beard but I have managed to get to living in the forest, but they probably didn’t suspect Thailand. Whilst completing my Masters in Zoology with Herpetology degree from Bangor University, I further developed my fascination with wildlife, primarily herps, but also my interest in the science of understanding animals itself. My focus areas during university mainly considered Pit Vipers as a study species in genetic studies and even studying morphology of certain species, so being able to move over to study elapids and conduct field work was a chance I wasn’t willing to pass up on. Having previous experience conducting habitat management for UK herps and conducting population surveys of protected amphibians but also have a background in animal husbandry as I have kept many reptiles myself at home, yet have limited experience helping with field studies. Learning how to radio track cobras, observe their natural behaviours in their natural environment and other amazing field techniques will be invaluable experience which I hope to someday apply to any future research I may conduct by myself or within a research group. Krunal is from Surat, India. He is passionate about wildlife research & conservation. Previously he has worked on various projects such as Human-Leopard Conflict Management Program, Vulture conservation project, Deer breeding project, etc in India. Except that he is also attending distress call of wildlife from human settlements and rehabilitating them in safe environment since last few years. He is part of IUCN Otter Specialist Group and conducting research on otters of South Gujarat. 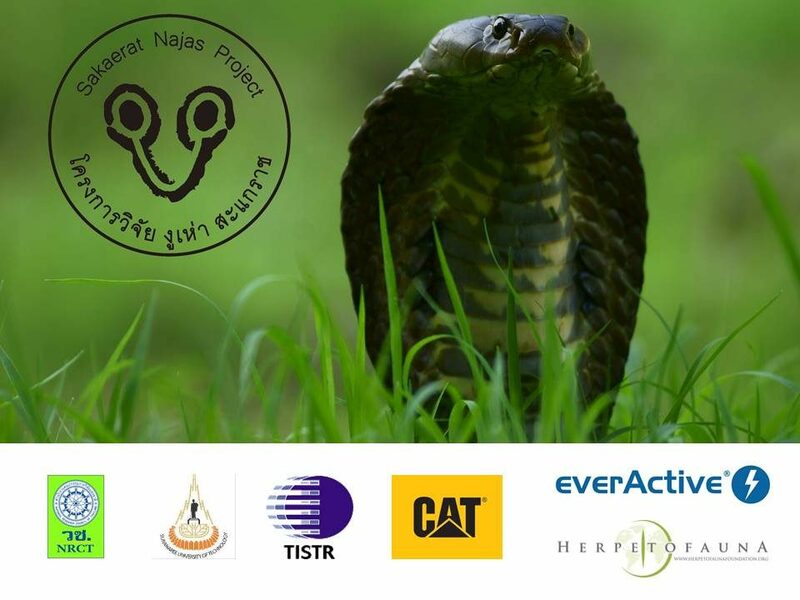 He is experienced snake handler and keenly interested to learn about Herpetofauna which brought him to work at Sakaerat Najas Project in Thailand. Krunal is part of our team second time already. We have worked together from December 2016 till June 2017. Growing up in small town Oklahoma, I dreamed of becoming a veterinarian after falling in love with James Herriot’s tales from All Creatures Great and Small. However, I wasn’t sure I could handle the pressure of dealing with suffering animals day in and day out. I floundered a little, unsure of whether to go to university, what to study if I did, and how to sound not-completely-lost when someone asked me my five year plan. I spent two years focusing on creative writing before deciding that even if I had no idea what else I wanted in life, I knew I needed a change of scenery. I moved to Australia, my birth country, when I was 20, and took up bartending. Three years and two trips to Europe later, I decided it was time to grow up and do something that would let me cultivate my love for the one constant in life that kept drawing me back in – nature. I moved to Melbourne and completed a BSc at Monash University in Ecology & Conservation / Zoology in 2016. After graduation, I really wanted fieldwork experience to help me land a career. After a couple of shorter volunteer stints, I wound up here at the Sakaerat Najas Project. It’s been daunting, since my only herpetological experience to date is skink behavioural studies with the Chapple Lab Group in Melbourne! I’ll definitely be learning a lot, and accepting care packages of Australian lollies and bulk orders of Milo to keep me going. Maria is from the United States where she recently graduated from Southeast Missouri State University with a B.S. degree in Wildlife and Conservation Biology. She is most interested in the herpetology field which she has been a part of various research studies working with salamanders, lizards, snapping turtles, and other reptiles and amphibians in the United States. Maria aims to broaden her knowledge of herpetology through fieldwork at the Sakaerat Najas Project. Outside of her work, Maria enjoys hiking, traveling, and eating cheese; which she misses deeply. Maria also wants to eventually get her master’s degree to further pursue her education in the herpetology field. Her enthusiasm for wildlife conservation is welcomed by the team and she is looking forward to working in and exploring Thailand. France, Switzerland, New Zealand, nobody knows where William is really from. However, one thing that is certain is his love for Thailand, where he has been living for the past two years. During this time he enjoyed, riding his scooter, eating century eggs, and casually squatting around with tracking devices. Now based at the Sakaerat Research Station, he is thrilled to diversify his skills, learn more about snakes, interact with villagers and discover in depth the dry evergreen forests around the station. William has been working in Asia since 2013, after cycling around the world for a year. For his Master Thesis in Geography he studied the impact of trekking tourism on the livelihoods of villagers in a remote area of Nepal. Additionally, he wrote the first comprehensive sustainable tourism guide of Nepal in French, published by Via Tao. William worked for a small travel agency based in Chiang Mai, in northern Thailand. It was then that he decided to become more deeply involved in conservation and join the Sakaerat Najas Project team, which is based in one of his favourite parts of the world. William hopes that this fieldwork experience will allow him to immerse himself in the pursuit of an environmental career. Michele is an Italian researcher, with a particular passion for herpetology and carnivore research. He earned his MSc. in Ecology, Evolution and Conservation at Imperial College of London in 2015. Since then, he worked as research assistant toward several research groups. His experience covers a broad taxonomic and geographical range, including Canadian prairie fauna and felids camera trapping in Costa Rica where he worked as field researcher for GVI Costa Rica. “I come from a small village in the mountains of the south of Spain, called Valdepeñas (it means “Valley between rocks”). I was the typical child who loves school, and reading, and nature. Back in that time, I wanted to become a veterinarian, and I kept that goal until halfway through high school, but finally I changed my mind. Mostly when I realized that being a veterinarian would mean that some animals would die in my hands, and that wasn’t how I wanted to make a living. In the end of high school, a really good teacher showed me the amazing world of science in general and biology in particular, so my new goal in life was pretty clear. I started a bachelor’s degree on Biology at the University of Granada, with the idea of ending up working in the university as a researcher. As the years went passing by, I changed my mind again, towards conservation. If something was constant during my life was my love for biodiversity, for nature itself, so I thought that the best way of making a living for me was conservation. Working to preserve the best thing we have in the whole universe, life. That looks like something worth to work for, I think. So, after working a bit with birds in Granada and graduating, I started to look for some kind of job to get a bit of field experience, an important feature for working in this matter. I applied for a volunteering position in Bart’s team here in Sakaerat, and in no time I found myself tracking some beautiful cobras through the forest, dealing with rain, snakes, lizards and spiders. Pretty hard work, but really rewarding though. Thanks Bart for the great experience. I have recently graduated from the University of Hull with an undergraduate degree in Zoology. Although I really enjoyed my time at university and learnt a lot I realized that I really wanted some practical experience in the field before deciding what I want to do next. The chance to observe cobras in the wild and learn about their behavioral ecology was an opportunity too good to miss. Since arriving I have had the chance to watch a radio transmitter be implanted, felt a cobra’s heartbeat and observed and monitored their sometimes predictable but often erratic behavior. Trekking through forest in Thailand in 40 degrees heat and monitoring snakes is hot, tiring but great fun and invaluable experience. In the future I would like to participate in some more fieldwork and maybe one day run my own project. Vanessa is the only Thai volunteer in the team (which the team still can not pronounce her last name correctly). Her skills could aid the team in term of community outreach and translation. She is undergraduate in English for International Communication but her love for snake is beyond measure. As a volunteer she is interested in gaining more knowledge and experience in the field she never been familiar with before. She honestly enjoys her life as a solo tracker and interpreter, even now villagers thought that she is a foreigner who can speak Thai. Since graduating from Anglia Ruskin University with an undergraduate degree in Zoology, I’ve been moving between research and conservation projects in South East Asia. From establishing a community fisheries organisation in Cambodia, herpetofauna inventories in Indonesia to camera trapping small carnivores in Borneo. After managing a year in the freezing north to complete an MRes in biodiversity and conservation at Leeds University, I’ve come back to Asia to gain some radio telemetry experience and get back out to the forest! My ultimate goal is to conduct ongoing research on biodiversity responses, to logging and plantation development in Asia’s tropical rainforests.